Guided Level Radar Continuous Level Transmitter for level measurement in liquids. Guided Level Radar Continuous Level Transmitter for interface measurement in liquids. 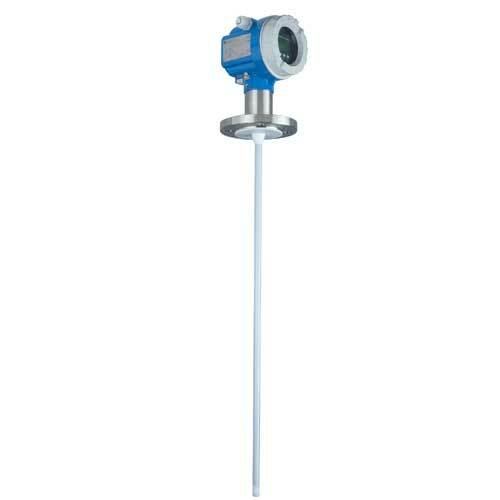 Guided Level-Radar Continuous Level Transmitter for level measurement in liquids. Weather protection cover for devices with F12/T12/F23 housing. The Levelflex M FMP41C is used for continuous level measurement of liquids andh as the highest chemical resistance. Levelflex M FMP41C with great success in level measurement involving foam. Fluctuations in the density. temperature, or build-up donot influence the measurement. Materiaal: 316L. Gebruik: VU331, Levelflex M, Micropilot M.
Materiaal: 316L. Gebruik: Levelflex M, Micropilot M.
4-Lijns alfanumerische weergave. Gebruik: FMR530/532/533, FMR540, FMU40/41/42/43/44. Remote display + lokale bediening. 4-regelig LC-display. :: Menu-bediening van platte tekst. :: Eenvoudige installatie. :: Gebruikerstaal selecteerbaar. :: Weergave envelopcurve ter plaatse. Gebruik:FMG60, FMU40/FMU41/FMU42/FMU43/FMU44. Procespakking universele procesaanpassing. FDA vermeld. Gebruik: FMB50, FMB70, FMI51/FMI52, FTI51/FTI52/FTI55, PMC51. Verbindingskabel, dubbel afgeschermd. Gebruik: FHX40. Gebruik: aansluiting Micropilot M, Micropilot S, Levelflex M, Prosonic M, Tank Side Monitor, Deltabar S, Cerabar S, Gammapilot M, Micropilot I, Commubox FXA291. Verbinding RS232(52013675)/ ToF adapter FXA291 (71007843). Gebruik: FMG60, FMD77/FMD78, FMR230/ FMR231, FMR240/FMR244/FMR245, FMR250, FMU40/FMU41/FMU42/FMU43/FMU44, NRF590, PMC71, PMD75, PMP71/PMP75. Coax kabel. Gebruik: FMR230/FMR231, FMR530/FMR531/FMR532/FMR533, FMR540. Dummy antenne. Coaxkabel. Beëindiging weerstand / verbindingsstuk. Gebruik: FMR530/FMR532/FMR533,FMR540. Dummy antenne. Inbouw proces-verbinding. Core gat: 85mm. Materiaal: 316L. Inspectie cert. EN10204-3.1 materiaal. Seal: siliconen profiel pakking. FDA, EHEDG, 3-A compliant. Gebruik: FMI51/FMI52, FTI51/FTI52, FMP52,FMB50,FMB70,FMD71,FMD78,PMC51, PMP23,PMP55,PMP75. Inbouw proces-verbinding. Core gat: 65mm. Materiaal: 316L. Inspectie cert. EN10204-3.1 materiaal. Seal: siliconen profiel pakking. FDA, EHEDG, 3-A compliant. Gebruik: FMI51/FMI52, FTI51/FTI52, FMP52, FMB70, FMB50, FMD71, FMD78, PMC51, PMP23, PMP55, PMP75. Spacers voor staven 16mm/0.63in. Tmax 250°C/482°F. Materiaal: PFA. FDA, EG 1935/2004, EU 10/2011 compliant. Gebruik: FMP51/FMP52/FMP54/FMP55. Dynamic algorithms and Multi-Echo Tracking evaluation, a unique integrated HistoROM data management - FMP52 developed according IEC 61508 increases safety and reduces costs across the life cycle.